Clear, step-by-step organization introduces the research process and demonstrates how this systematic framework relates to evidence-based practice. 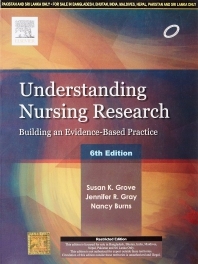 Emphasis on critical appraisal versus critique reflects contemporary usage in nursing research and evidence-based practice. Balanced coverage of qualitative research prepares you to approach research questions and clinical questions with an unbiased view of the researcher's methodology. Presentation of two different appraisal processes covers both the traditional in-depth critical appraisal process that prepares you for graduate-level work in research, and the concise, practice-focused research appraisal process that equips you for quick and accurate evaluation of the applicability of research findings to clinical practice.